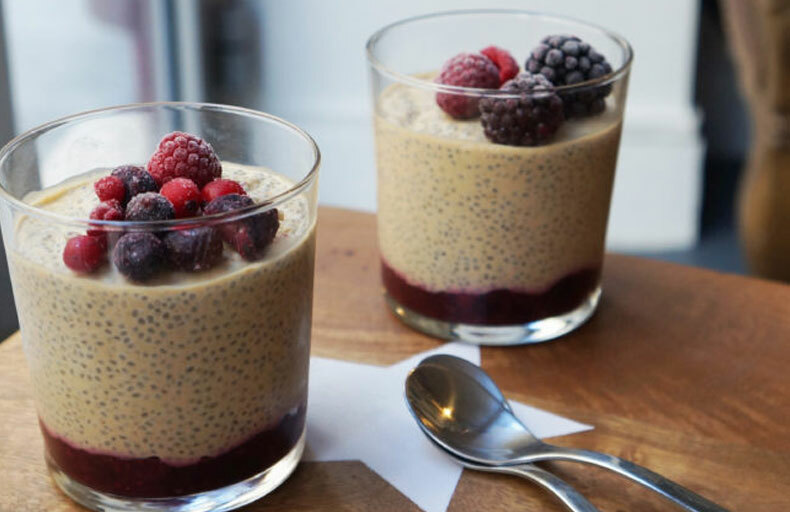 Today, the coffe shop 100% vegan Cloud Cakes (Paris, 75002) is revealing for Ecomil this chia pudding recipe, definitely very trendy! For a healthy and delicious breakfast follow the instructions of the co-founder Aelita DZHAFAROVA! In a small saucepan, heat red fruits and orange juice over medium heat until boiling. Reduce heat and cook for another 2 minutes. Remove from heat and add chia seeds, mix. Distribute this preparation in separated glasses and put in the refrigerator. Meanwhile, put the almond milk and coconut cream in a robot, add vanilla extract, maple syrup and almond butter. Mix everything to make it homogeneous. Add the chia seeds and mix it several times but do not destroy the seeds. Place the mixture in the refrigerator and wait 10 minutes. Then take out the compote and the pudding mixture from the refrigerator and pour the pudding into the verrines on the compote. Refrigerate for at least 2 hours (preferably one night). Thanks to Cloud Cakes for this recipe made especially for Ecomil! To discover their culinary treasures, go to 6 rue Mandar (75002 Paris) from Tuesday to Saturday (10h00 – 19h00) and Sunday (11h00 – 15h00) for a relaxing and vegetal brunch!